Riding your bike is great; it takes you away and allows you to think. It allows you to empty your head and start again, be creative and chase a goal. It allows you to focus your mind and push your body, or... you can forget all of that, and just ride. 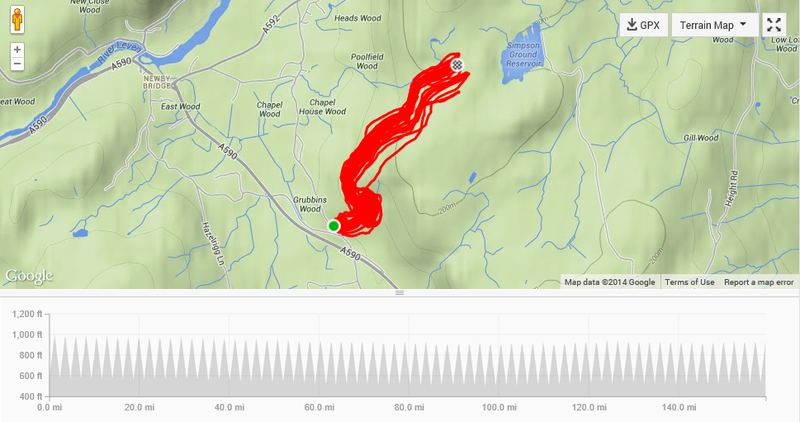 If you are reading this and thinking of joining the latest climbing craze of “Everesting” be warned… you might just catch the “Everesting Bug” This, I guess, is what happened to me in June this year, after completing my first Everesting on GreatDun Fell. The 140 mile ride took 15 hours and totalled over 31,000ft of ascent. Three weeks later I was battling with the iconic Hardknott Pass, 30x up the savage climb was enough to claim Everest number two. August was here and it already felt as if summer was fading, the days were shortening and the temperature cooler, not badly but it was a sign of things to come. I had an idea for a third Everesting, but knew it wouldn’t be too long before the changing seasons would bring a halt to any such plans. Originally from a mountain biking background, I entered my first race aged nine, my older brother Jack raced and bikes were always in the family. This meant spending many a weekend up and down the country at whatever race was on at the time. It was a great experience and went on for a good few years, after which things drifted. I found myself dipping in and out of cycling up until the age of 27, I then started training and entered a few mountain bike enduro events. I did a bit of traveling and raced a few times in Australia, before finally returning home and buying a road bike in August 2012. I really enjoyed the switch to road cycling but would still miss the dirt now and again; with this in mind it seemed simple… The third Everest would be Off-Road. To qualify as an Off-Road Everest, the whole ride would need to be ridden on a dirt road/track/path/MTB trail etc, but definitely no tarmac. I figured some kind of woodland fire track would fit the bill, hopefully not too rough and with a steady gradient. My partner Mairi and I headed to the Lake District in search of such a climb, after speaking to a few locals we were pointed in the direction of Chapel House Wood near Newby Bridge. It turned out to have what seemed a very suitable climb, 1.2 miles of fire track that twisted its way steadily up through the woods. The tracks surface was varied, overall it was pretty hard and compact, but with some looser rough sections thrown in too. The plan was to hopefully use the road bike with a set of 25mm, treaded winter tires, and as long as I picked my lines carefully it looked as if it should be possible. Two weeks after finding the climb, and what can only be described as a last minute decision, I’m on my way over for a 3rd Everest attempt. The usual early start is more important than ever, and by 6.20am I’m parked at the bottom of the climb, kitted up and ready to ride. I start ascending and try to pick as smooth a line as possible, the fewer bumps I hit the less energy I’ll waste. The first two thirds twists up through the thick woodland, after this the views off open out to the left. Soon you can see glimpses of Lake Windermere down below, and on reaching the summit a total of 430ft have been climbed. It was a breezy changeable kind of a day and the climb would need tackling no less then 68 times to complete the challenge. It felt good to be riding off-road again; constantly having to pick the best line can help keep you alert and stop things getting boring. Ok so it wasn’t exactly extreme off-roading with multiple drop-offs, but I was on a road bike and it was certainly tougher than on the smooth tarmac I’d got used too. I set off down to see how my machine would handle the descents, the faster I went the worse it felt. Normally when venturing off road my tires would be 3 times this width. Not only that but I’d be on a full suspension bike with at least 4 inches of travel at each end. Not now though, I was only hitting 30mph at a push, but with a bike that’s designed to be as stiff as possible, every little bump when right through me. I rattled my way to the bottom, and completed the first rep in around 13 minutes. I tried to get in to a good rhythm, 68 times seemed a long way away, so I just got my head down and started ticking off the reps. After an hour of riding I’d almost done five, and after another hour I finished my 9th. It was going ok, I was managing to pick pretty smooth lines on the way up, but couldn’t do much about the bumpy descents. I managed to hit my leg with a big stone coming down number four, this caused a bit of pain and cursing but was fine. I also met a fox a few reps later, he seemed surprised to see me riding towards him, and quickly ran off into the woods. As I hit the 4 hour mark I’d managed 18, not bad, just another 50 to go. At just over 5 hours I’d done 23, and with my first third complete it was time for a break, 10 minutes in the car with tea and sandwiches. I’d been stopping every few reps or so for a quick fuelling up, drinks, gels, bars etc… But this was my first sit down. It was nice but short, the 10 minutes felt more like 2, I climbed back on the bike and continued riding. After the break time started to slow down, I rode my way up, then rattled back down. Up, then down, then up, then down. All the vibrations were effecting my grip and hurting my hands, I had to just rest on the bars rather than hold them. As I approached 7 hours I finished number 30, I’d ridden 70 miles and climbed 12,900ft. The elevation was slowly increasing, but it was taking a while and I wasn’t even half done. Another hour in the saddle did get me to the half way mark of 80 miles, 8 hours and 34 reps, it felt like it had taken a while to reach this point, so I tried not to think about doing it all over again. Physically I wasn’t doing too badly, but mentally I was struggling. Compared to my first Everesting of only 15 reps, this seemed harder to get my head around. I guess 1 sounds less than 5, and 4 a lot less than 20. I get that it’s just physiological, but I definitely found the larger climbs less mentally taxing. The fact this ride was also shaping up to be the longest time I’d ever spent on a bike, wasn’t exactly helping. Apart from an early morning mountain biker, the only people I’d seen or spoken to were dog walkers, they were mostly pretty friendly, and would say hi as I tried not to run over their beloved pet. It was only once I’d passed them several times that the polite hellos would stop, and the look of “what the hell is he doing” would be written on their faces. I stuck with just giving them a smile and a nod, to be honest I was getting a little too tired to do anything else. I continued to ride with minimal breaks, I’d of loved to put my feet up for half an hour but could see time slipping away. I finished my 39th in 9 hours and it’s fair to say, the novelty of riding off road had long gone, I wasn’t far off two thirds but every rep would drag on and on. At 5:15pm I’d made it, two thirds completed! I’d been riding for 10h45m, covered 109 miles over 46 reps and climbed 19,780ft. I had planned on a short break but my partner Mairi was due to turn up soon, I decided to try and keep moving until she arrived. 3 more times I pedalled my way up, then on arriving down from my 49th I spotted Mairi in the car park. After not far off 12hrs riding this was a very welcome break, a friendly face and some words of encouragement went a long way in lifting my spirits. Fuelled up and no longer feeling so mentally tortured, I climbed back on and continued to ride. Having the company was great, it was a good chance to forget about what we were doing. Mairi didn’t try and sprint for the top, although she may have stood a good chance of beating me if she had. After an enjoyable few reps the light was just starting to fade, and with 10 reps remaining, Mairi packed up her bike and left me to it. It was 8.20pm and I’d been on the go for 14hrs, I’d climbed 24,940ft and covered 137 miles. The finish line was in sight but with the toughest 3 hours to yet to come. I wanted to ride as long as possible before having to rig up the bike lights, I hadn’t expected to need them, so had limited batteries with me. As the light disappeared the temperature dropped, I made it to number 61 before having to stop. I attached my lights as Mairi poured me a hot drink, by this point I was suffering, and stuffing my face with anything my stomach could handle. As I continued to ride the sky turned black, the woods seemed a different place after the sun had dropped. As it grew darker still, all I could see was my light beam in front, and the shadows it made. By now each rep felt like it was taking twice as long as when i started, in reality they had slipped from 13 to around 17 minutes. At 10pm I clocked 150miles, I was feeling pretty ruined but wasn’t far away. I kept trying to follow a smooth line as I climbed up through the dark woods, it was like being in a bubble, just me with my beam of light and the track in front of me. As i approached a corner my light flashed passed something further up the track, whatever it was I’d startled it. As I got round the bend my bubble burst, only 30 yards up ahead were a big pair of eyes. The eyes belonged to a large dog standing right in the middle of the track, I couldn’t help thinking this dog looked as much like a wolf as anything I’d ever seen. He stared straight at me with a look of fearless curiosity, I slowed down wondering what would happen next. Whatever it was, it was alone, it wasn’t afraid and it seemed a little too interested in me. Just as I was getting too close for comfort, he turned his back and began walking away. He didn’t seem frightened, but as I got even closer, I was slightly relieved to see him pick up his pace and disappear over the hill. After that little encounter I was quite pleased to make my way back down, I arrived back at the car and asked Mairi if there were still wolfs in this country? “NO!! SHUT UP!! WHY?” She replied “Erm no reason” I said, and quickly set off back up the climb. No drama this time, just back to the job in hand. As I arrive back down I’ve been riding for 16hrs 25mins, and only have 2 more climbs remaining. Just as I think I might stop for a minute, I hear a beep from my Garmin GPS “Low Battery” is displayed on screen. This is a bad sight, if the Garmin runs out, my ride won’t be saved. The battery could die at any moment, so there’s no way I’m stopping. I set off back up the hill, heart pounding and fingers crossed, I can’t imagine losing the ride after this long in the saddle. I complete the penultimate rep at a good pace, the ‘Low Battery Fear’ has given me an adrenalin boost. Before I know it I’m on my final ascent, all I have to do is make the top before the Garmin goes dead, then I can take a picture and save the ride. I’m climbing quickly and approaching half way, then unexpectedly, darkness!! My light has failed, I check the connections but it’s totally dead. I’ve no choice but to carry on riding, it’s seriously dark but my eyes do start to adjust, I can just about make out the difference between the track and trees. I’m no longer picking a line but just trying to reach the top, and then eventually, I realise… that’s it, I’ve make it. I quickly take a picture of the Garmin and save the ride. Massive relief as my Off-Road Everest is complete, 16hrs 50mins, 160 miles and 29,232ft of ascent. The descent back to the car was certainly interesting, and hopefully the last time I’ll be riding a road bike through the woods in total darkness. I make it back to the car for 11.20pm, Mairi helps me pack up then we hit the road. As I follow her back the heavens open with a torrential rain storm, a lucky escape I think to myself. We eventually make it home, and 22 hours after setting off to Everest Off-Road, my head finally... Hits the pillow. Cumberland And Westmorland Herald Feature. Great stuff, I can't imagine how hard an off road climb would be!